Table data is populated via table editor. 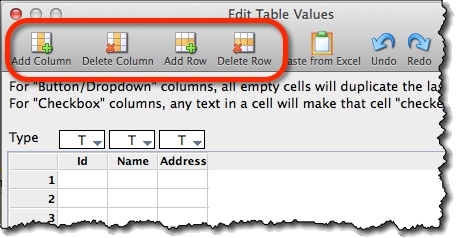 Table columns are defined in the property panel, outside table editor. 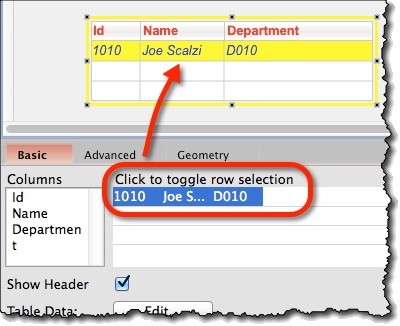 Table width is increased automatically to adjust to the column titles you specified. This approach is handy when you need just a quick empty table; you specify the columns from the property panel and you are done. When you need a column without a heading, add a dummy column by adding a blank ” ” title as a new column. In table editor, you can populate the table with data and format the table. 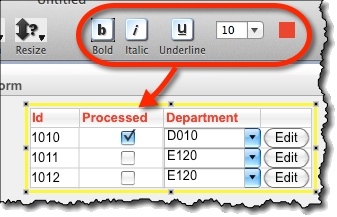 Clicking the “Edit…” button (“Table Data” option) on property panel. 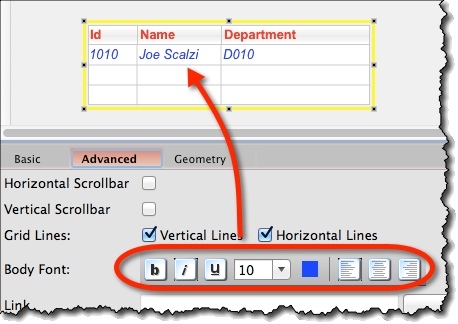 Use Add/Delete Column and Add/Delete Row icons on the top toolbar. If no column/row is selected, new column/row is appended to the end. If a column/row is selected, new column/row is inserted before it. 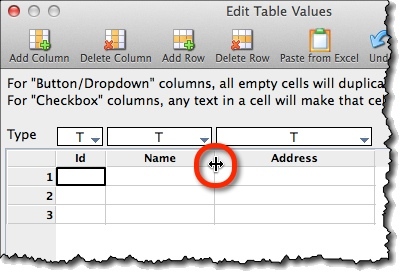 For “Checkbox” type columns, the checkbox is ticked when the cell is non-empty. For “Dropdown” and “Button” type columns, any value will be automatically repeated within the same column. Quick way to enter data is to paste it from a spreadsheet. Copy data from a spreadsheet (e.g. MS Excel). Select the top-left cell where data will be pasted. Pasting will not add rows or columns automatically. You have to add appropriate number of rows and columns beforehand. You can format only the “Text” type columns. You can turn on or off both horizontal and vertical gridlines. You can add scrollbars, both vertical and/or horizontal. 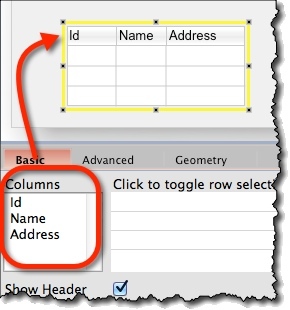 Columns (“Basic” tab) – Here, you add, delete, and rename table columns. 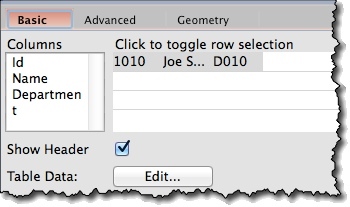 Click to toggle row selection (“Basic” tab) – Select or deselect rows that will be selected. Show Header (“Basic” tab) – Whether or not to show the header row. 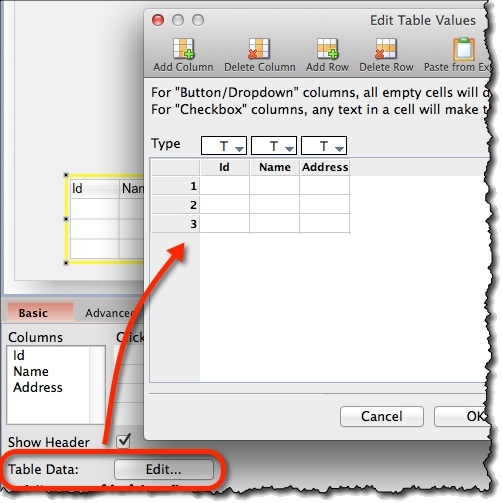 Table Data (“Basic” tab) – Edit button opens Table editor. 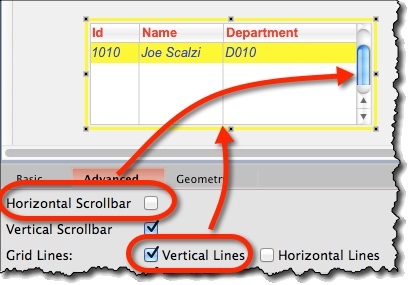 Horizontal and Vertical Scrollbar (“Advanced” tab) – Switches scrollbars on or off. Grid Lines (“Advanced” tab) – Switched on or off grid lines, either vertical or horizontal or both. Body Font (“Advanced” tab) – Here you can format table data.